Inbound marketing is a methodology based on attracting our target audience by accompanying them through their journey towards a purchasing decision. Inbound marketing strategies take their audience by the hand from brand discovery to brand loyalty. The term ‘inbound’ was defined for the first time in opposition to outbound marketing. Outbound marketing is channelling a message outwards in order to capture users. Now if we were to take both inbound and outbound strategies and put a symbol on each, inbound marketing would be the equivalent of a magnet, wherease outbound marketing would be the equivalent of a megaphone. Inbound marketing is a set of techniques and tools that are based on attracting potential customers non intrusively. With them, we seek to attract more traffic to our website, make attractive offers to users to become leads and guide them through the lead nurturing process until they become loyal customers. Attracting traffic. Getting visitors to the brand's website is an indispensable condition for the entire process to begin. For this we use different techniques such as SEO, SEM, content marketing or social networks. Lead conversion. Here we seek to attract the user with a content or offer of interest in exchange for leaving us their data. Automated marketing. Through lead scoring and lead nurturing techniques, we filter leads into various workflows and convert them to customers. Loyalty. No strategy is complete without thinking about loyalty, that is, how to get customers to stay loyal to the brand and make repeated purchases over time. Analysis. Finally, we will have to measure and analyze the results based on our key performance indicators or KPIs, to adjust the strategy if necessary. Another resource used to clarify the different phases of the inbound journey process is the "conversion funnel": at the top of the funnel we have all the users who visit our website and content, while at the bottom of the funnel (the most narrow bit) we have those who we managed to convert clients. Phase TOFU or "top of the funnel": here we have users who begin to recognize a need related to our brand and seek solutions, but are not yet ready to convert. Phase MOFU or "middle of the funnel": in this phase the user is considering several possible solutions for their need. BOFU phase or "bottom of the funnel": the user is almost ready to convert and only lacks the final impulse. Now to the other side of the coin- outbound marketing. Outbound strategies are based on getting in touch with a very large number of users to channel our message to them. Within the world of digital marketing, we see outbound marketing techniques in the form of as banners, ads on social networks or email marketing. Now that we are clear about inbound and outbound marketing, we are going to look at some of the key differences between them. The outbound marketing is quantity by nature, since its intention is to reach as many users as possible. On the other hand, its success rate is very low, since these users are not necessarily interested in the products and services offered. In contrast, inbound marketing seeks to attract selected users. Since it is the user who has to take the first step, we can start filtering contacts with the potential to be interested in our products and services. Outbound marketing is based on interrupting the user to distribute our message (think, for example, television commercials or banners that cover the content you want to read). Although this interruption can be effective at the time of drawing attention, it can also generate rejection in the user. In fact, in recent years there has been a boom in ad blockers to avoid such intrusive ‘outbound interruptions’. In contrast, inbound marketing seeks to ask the user for permission to communicate with him. It is the user who voluntarily approaches the content of the brand or even leaves their data so that we can continue to send them messages. Through an inbound technique, our marketing resources are ensured to be dedicated to those interested. Inbound the now, and outbound a thing of the past? Since the term "inbound marketing" did not emerge until 2005, sometimes it is tempting to identify outbound with old and inbound with modern. But this does not necessarily have to be the case: some digital marketing strategies, such as display advertising, are still outbound. Is inbound marketing necessarily better than outbound marketing? Although statistics show that inbound strategies high return on investment, the truth is that this methodology is not without its limitations. For example, your inbound marketing scope will be limited to the number of interested contacts you have. For that reason, in Cyberclick we consider that both strategies are compatible and in fact can reinforce each other. Outbound marketing has the potential to attract a large number of users, which we can then capture to be part of our inbound processes. For example, we can include information about the brand's blog within a large-scale campaign, on display or in traditional media. Segmentation. Whatever the scale of the campaign, we must be very clear about who we are targeting and why. Based on our buyer or ideal customer, we can develop different profiles to segment the audience. Respect the user. Although we opt for outbound strategies, we should always aspire not only to not bother the user, but to offer content that they want to consume. Automated marketing. Automation techniques can be applied to all types of campaigns to reduce human error, save time and costs and optimize results. Measurement and analysis. Fundamental in any marketing plan, is to be aware of what is happening and improve our campaigns. 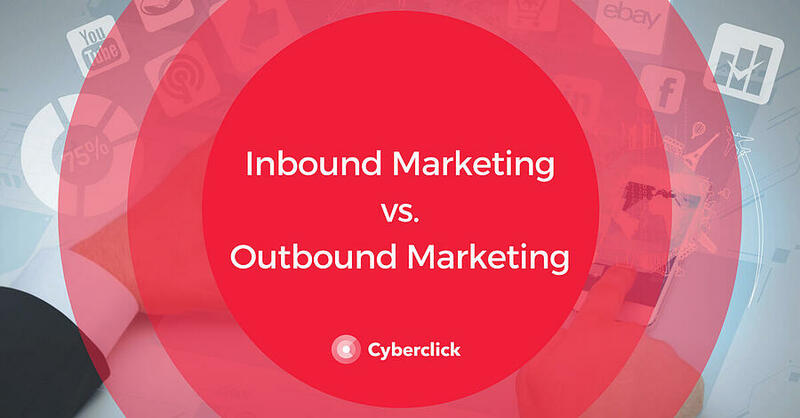 We hope that this information has been useful for you to better understand inbound and outbound marketing, what are the differences between them and how they complement each other to achieve the objectives of a brand. Understanding the differences is the first step on your way to launching your own inbound and outbound marketing strategy. If you are looking for ways to attract and retain customers, Cyberclick can help you attract traffic to your website through different channels, guide the entire conversion process to customers and optimize results on a constant basis. How can we help you with your Outbound Marketing & Inbound Marketing strategy?